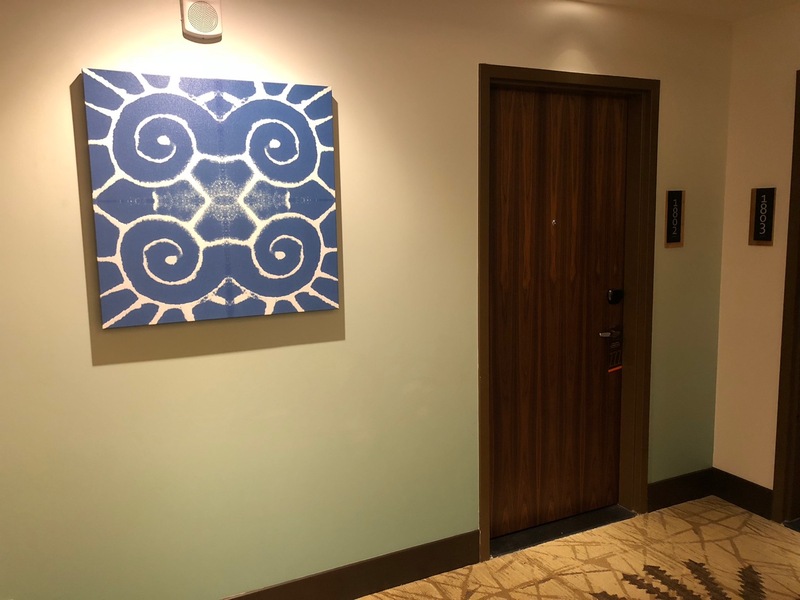 The Hyatt Centric Waikiki Beach in Honolulu offers a great compromise between the full-service Hyatt Regency and limited service Hyatt Place, all within walking distance. But it’s not a beach hotel and would not be my first choice if visiting Honolulu. After arriving from San Francisco on United’s final 747-400 flight, my uncle and I headed to the hotel via taxi. Unfortunately, Uber X is not permitted for airport pickups at Daniel K. Inouye International Airport. Traffic was horrible on H1, but we arrived about one hour later (a 9-mile drive). Do yourself a favor and don’t arrive into HNL just before rush hour. The hotel lobby is a few floors up. As you enter the on the ground floor you’ll notice a Starbucks Reserve (upscale Starbucks) on the ground floor and an elevator up to the lobby level. The lobby is spacious with plenty of seating and access to most of the hotel amenities including the restaurant, pool, sun deck, bar, and fitness center. An associate welcomed us and offered us both a glass of pineapple juice (this is an advertised perk of the $25/night “resort” fee, which was waived for me on account of my Globalist status). She also informed me that I had been upgraded to a suite on the 18th floor. Our room was large and irregularly shaped. It was dark when I reached the room, but warm natural light spilled in the next morning. Typically in a suite you walk into a living room and then into a bedroom, but this was the opposite. Here, you entered into the spacious bedroom first and then into a small living room. The bathroom was a bit of a letdown. Some suites have exotic Toto toilets and bathtubs, but our room just had a standard toilet and shower. I also thought the floral wallpaper inside the WC looked tacky. Like all other Hyatt Centric properties I have been too, this one had Bee Kind amenities. I appreciated the power plugs and USB ports built into the nightstand. Rather than complimentary water bottles as we tend to think of the word, the hotel provided reusable water bottles with directions to drinking fountains. The view from the room could not be characterized as “ocean” by any stretch, but I greatly enjoyed the city views the next mooning. Not wanting to stray far, we were both in the mood for hamburgers and enjoyed a burger and French fries downstairs at “The Lanai”. Nothing fancy, but the $17 was worth it for the convenience. Throughout the meal, we were the only guests in the restaurant. I was battling a horrendous head cold and after dinner we walked to Walgreens so I could purchase some medication. The Advil PM worked like a charm and I quickly fell asleep and felt much better the following morning. Breakfast is also in “The Lanai” and featured both an a la carte menu and buffet. My uncle enjoyed the buffet, but I ordered off the menu. The buffet featured fresh fruits, pastries, cereals, yogurts, and hot items like pancakes, eggs, bacon, and potatoes. I frankly thought it looked underwhelming. Still not feeling 100%, I just wanted a light breakfast and ordered an egg white omelet, berries, and a “detox” green that was a mix of green fruits and vegetables (the highlight of the meal). Service was slow…one waitress seemed to be handling about 10 tables at once. I felt bad for her, especially when she apologized profusely and waived the cost for my detox drink and cappuccino without request. Shame on the hotel for not giving Lauren more support. My entire breakfast bill was waived due to my Globalist status. A full-service bar offers beer, wine, and cocktails. With a stuffed up noise and horrible cough the night before, I was in no mood for any alcohol. Outside the restaurant is a shallow wading pool with about two dozens chairs surrounding it. This is pool is not intended for swimming, but the deck looked comfortable. One guest room has been turned into a fitness center. The equipment is new, but limited, with a small handful of strength training equipment and plenty of cardiovascular machines. Waikiki is not my favorite place to be in Hawaii. In fact, it is probably my least favorite. That said, my uncle loves it and if you like the hustle and bustle of a touristy-feeling city with plenty of shopping and chain restaurants, this is your place. Just outside the hotel is an entrance to the International Market Place, which has transformed itself from an eclectic mess of family-run business to a luxury shopping mall. It’s beautiful, but I miss the charm of what it used to be. If you’re looking to get to the beach, plan on a brisk 8-10 minute walk a few blocks southwest. My favorite hotel on Ohau is the Kahala and I don’t think any Waikiki hotel compares to it. But in terms of finding a good nexus between price and value, I do believe this hotel scores well. Don’t expect the lap of luxury, but do expect a comfortable room and friendly Hawaiian service. Previous Article Will Low-Cost Carriers Join Star Alliance? A $25 “resort” fee for a hotel that’s a 10-minute walk from the beach is just plain heinous, right up there with the “urban destination fees” that are spreading like fireants in DC, NYC, and SF these days. I won’t be giving this hotel my business (or anywhere in Waikiki for that matter) because of the fees, but otherwise this place seems pretty reasonable. It’s especially impressive that your server was proactively apologetic about the slow service. Is the suite you got the suite someone would get for using a TSU? Is the globalist breakfast no limit and you can order off the menu or get the buffet? I have an upcoming stay in a few months, where I applied a tsu. I’ve stayed at the HR so planning to check this one out to compare. Thank you! I did not use a TSU…I believe that suite is larger with a more traditional living room and bathroom with Toto toilet and tub. I was in that suite probably RIGHT before you (mid Jan), and I used a TSU. How can the hotel charge a “resort fee” when (1) it isn’t a resort, (2) it doesn’t even have a pool big enough for more than a dozen guests, and (3) there’s no spa?